Nejimaki Seirei Senki: Tenkyou no Alderamin localizes to Alderamin on the Sky. While the anime itself doesn’t take place in the sky, I’ve been up there myself a handful of times when flying to other states. I don’t hate flying, but I much prefer to be on the ground. It’s safer, has better Internet, and I don’t have to share an armrest with another. Also, fast food. I can go get some tasty McDonald’s whenever I want; can’t do that on a plane. Alderamin is like flying on a plane: It has its perks, but it could improve in certain areas. 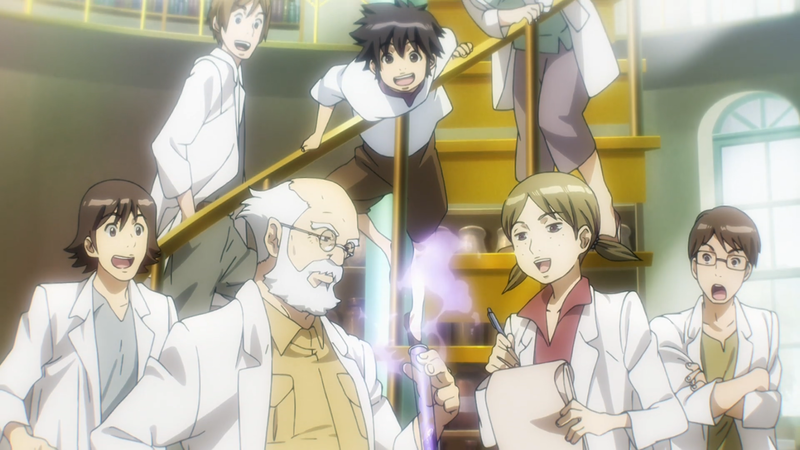 The anime follows Ikta Solork, resident lazy man and best friend of Yatori Igsem. When the two – alongside Torway Remeon, Matthew Tetojirichi, and Haroma Becker – encounter rough waters that shipwreck them in enemy territory, war changes their lives. For better and for worse. There’s a lot more to the show than at first seen. Not that it’s nuanced, let alone exceptional, but it does try its best to provide a multifaceted experience. On a militaristic front, Alderamin does well. Ikta’s battle decisions, like hiding a fallen tree in a river to create a makeshift bridge or using the smell of oil as a double-feint, are small. Yet they drastically change the course of a single battle. Of course, the gunfights and the sword duels ultimately sway the tide, but Ikta’s strategies give the different skirmishes their edge. The differing effects of war also come into play. Adapting to a new environment. Deserters. The treatment of civilians. Unrest and the government’s moves to improve public morale. Living with a potentially incorrect choice. A lot of these details happen in the latter half of the story because that’s where the war really starts to take the helm. But, even in the opening half, where thoughts on fighting a pointless battle and knowing when to retreat, war’s effects are still present. The concept is brought up a lot throughout the season. Perhaps to a fault. But its connection to the wars at hand, such as with flying blimps and better weapons (i.e., technology), make it a relevant topic no matter the scenario. 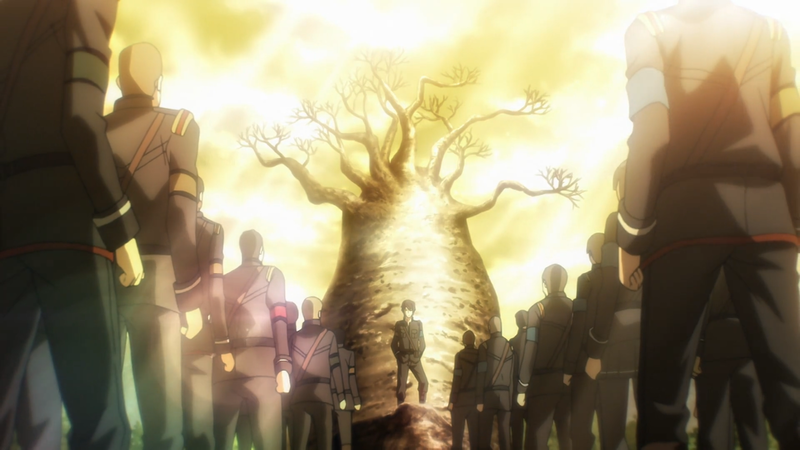 The interesting part is when the anime starts to introduce its religious element. Namely, Alderamin and the Spirits. Words on contradicting beliefs (“The bigotry that twists the truth by ignoring anything that doesn’t benefit God!”) and battles fought due to holy doctrines are thematically relevant to both the war and the science motifs. It gives these motifs more thoughtfulness through questioning. Is such a “holy” war sound? What does science mean in a world where tiny colored dudes are powered by geological chips? In war, who is right and who is wrong when opposing viewpoints clash? Are scientific discoveries blasphemous? Again, these questions are almost never answered directly by Alderamin, but the anime at least postulates them with this three-way combination. Simultaneously, the fantasy element cannot be denied. The Spirits command light and wind, water and fire. The various factions, such as the Kioka Republic and the Sinack Tribe, add cultural significance. The advent of a new “sniper” class improves current tactics. Combined with the war and the science and the religion, it stands as a nice backdrop to these other, more involved elements at play. The show can also be surprisingly comedic. From Yatori holding Ikta back from pouncing on Remeon to the entire conversation on the men relieving their sexual urges while stationed (“P-pay your respects to a lonely warrior!” as everyone salutes) demonstrate its comedic chops. While Alderamin (understandably) reduces the total amount of comedy as the war takes precedence, when it is there, it works to keep everything lighthearted. It even has some nice lines and metaphors. Yatori’s words on people are noteworthy: “Can’t build a house out of only straight sticks.” Ikta’s callback to the masturbation joke that also highlight’s one’s morals: “I don’t care if you’re a hero or a warrior. But I’ve got no patience for beasts.” His “Matthew, my friend…” as a sincere yet comedic opener whenever he addresses Matthew. These small bits of dialogue are placed all throughout the season, giving the audience more to contemplate and appreciate. Alderamin isn’t all praise, though. One of its bigger problems is the pacing. Episodes will sometimes jump ahead months or days at a time to get to where they need to be, losing out on build-up or at least feeling like convenience. Despite these jumps, the final arc of the season, which technically takes up the last six episodes, drags on as more and more tangentially related conflicts occur. Taken together, the plot’s movement feels all over the place, hurting the narrative’s pull on the audience. The villains are also an issue. Remeon’s older brother doesn’t reappear again after his failure, and Jean “The Unsleeping, Shining Officer” Alkiniks is nothing more than an Ikta clone minus the interesting personality. Furthermore, the dimwitted generals on the Empire’s side tread into overly evil territory. Although, the ending is perhaps the worst offender since it makes the whole season feel a bit unfair. Chamille unveils her big secret – that she wants the Empire to “lose” yet “win” with Ikta’s help – only right as the anime concludes. It does not retroactively make the prior events inconsequential because they established the characters, the themes, and Ikta’s reputation. But, because the main plotline was never even a factor this entire season, it ends Alderamin with a sense that not a whole lot was accomplished. Alderamin is yet another anime where its visuals, while strong in the beginning, slowly degrade over time. When the anime first starts out, it puts a large amount of stock in pizzazz. A shot of Ikta and Yatori with a purple nighttime sky as their backdrop. 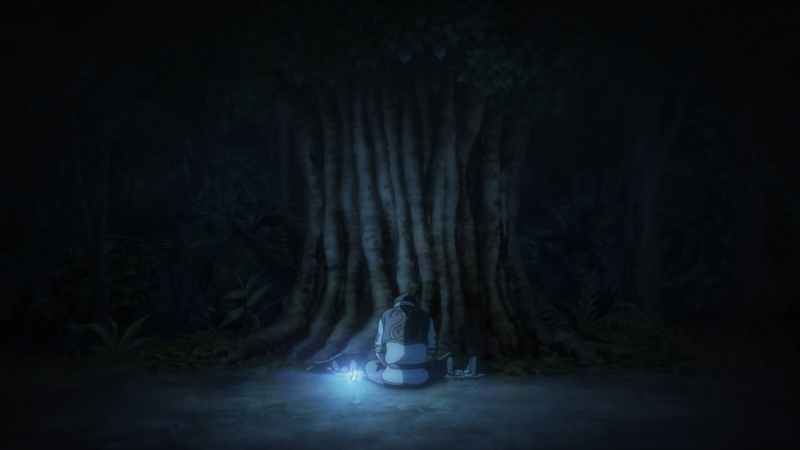 A fire’s light dancing across Chamille and Haroma as they sit within a nearby cave. Sunlight hits Remeon’s face as he walks about the school grounds. All the while, the locations themselves dazzle. Lush greenery filled with palm trees and local fauna. The capital city with its majestic, white buildings. Mountain ranges featuring scraggly passages and even rougher grounds. The anime steeps itself in these realistic yet fantastical areas, keeping in line with its premise. The animation, while not impressive, keeps up, too. Yatori going berserk against a bunch of defectors or Ikta fending off wolves with her (when they were kids) provide some cool action sequences. However, the further along the anime goes, the worse off it gets. The pizzazz gets dropped for the same red tents everywhere. The backgrounds turn into gray clouds, muddy encampments, and dense forests that are not as interesting as the fantastical elements before. And the different battles rely more and more on still shots of the characters in action rather than them actually performing their moves. 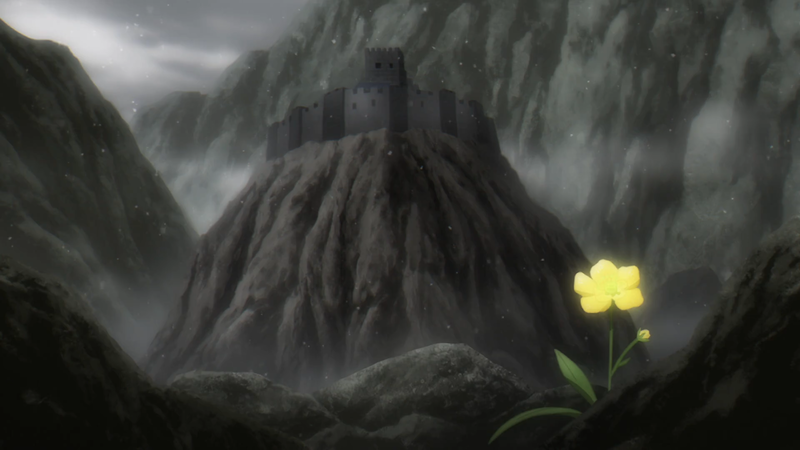 Shots like a lone flower in front of a defeated castle or the usual Ikta-and-Yatori back-to-back frame do appear, but these more cinematic ones are not as prominent. Still, the character designs maintain its artistic strength. Before joining the army, the cast have their own style. Yatori’s open shawl and shin-high brown boots. Chamille’s regal outfit. Ikta and the other men’s casual clothes. It gives them a sense of everydayness, that they belong both to their country and to themselves. When they enter the military school, they no longer don these outfits. However, what replaces them are officer uniforms. Black coats laced with gold and red embroidery, black pants to match the top, and various accessories (belts, buttons, etc.) give the cast of Alderamin a lean, proud depiction. Alderamin doesn’t have the best supporting characters around, but what it does have is Ikta. Ikta’s personality is established right from the get-go. He’s a lazy jokester. Smart in the ways of war, flirtatious with the ladies, and hater of all naturally born pretty boys. Plus, he’s arrogant. Not that he’s not kind or at least considerate towards his friends, but he certainly carries himself with an air of superiority. One of his best character moments happens right in the first episode. Chamille, fraught with emotion, demands that they escape from their in-enemy-country predicament. Ikta, however, grabs her by the face, treating her as the child she is and disrespecting her royalty status. It captures his better-than-you attitude, but, more importantly, it highlights his disregard for convention. For that’s his biggest strength. Rather than worshipping the bare minimum of words in a history textbook or following the old tactics of old war generals, Ikta thinks outside the box. Setting aside their paint-bullet supplies in the rain to produce more ammunition. Eating poisonous bugs after removing their fangs. Using so-called “science” to make the most informed of decisions. But he’s not just a man with a logical mindset; he’s also a man with a heart. He understands that the mistreatment of Spirits, regardless of religion, is something abhorrent. And he will literally cut off his own pinky as a sign of cultural placation towards a friend from long ago. The season doesn’t explore his sensitive side involving his mother, but, clearly, it’s something that troubles him. And the majority of the season showcased how easy it all was for him while the latter sections tested his mind to the max. In other words, he isn’t the most nuanced of characters, but the anime has his progression in mind. If nothing else, his relationships with the other characters help to round him out that much more. With Matthew, he calls him “my friend,” and with Haroma, he makes her the object of many lascivious remarks. But for both, he comes to learn of the resolve of others. How people that may seem incapable of handling a situation are willing to prove themselves – either through mettle or through care. Remeon is someone who has a hard time coming to terms with killing another in times of war, dealing with a mean older brother, and trusting his abilities as a marksman. Ikta, though, believes in Remeon more so than Remeon believes in himself. Such belief grants Remeon the courage he needs to fight on the battlefield. Chamille is the one to force him out of his comfort zone. She makes him into a soldier (the last thing he ever wanted to be), she brings up his mother (something that makes him furious), and she looks to him for answers (overwork being the death of heroes and all that). But it works the other way, too. His teasing about her age and his treating her like everybody else gives her the chance to be someone besides the princess of the whole Empire – and makes her realize Ikta’s full potential. Without a doubt, though, Yatori’s relationship with Ikta is the most interesting. Where one may think her to be an immediate (and the main) love interest, the connection they share is purely platonic. She keeps Ikta in line as best as she can whenever he does something unnecessary or foolish, and he does what he can to lessen her burdens as she takes part in the war. As they would describe it, they are each other’s left and right hands. Episode five makes this obvious; it’s dedicated to depicting how Yatori and Ikta’s relationship came to be. Their time eating food, learning about science, and fishing in the river grew them close as friends. But it was their nighttime defense against a pack of hungry wolves that demonstrated their fortitude and how well they matched together. Ikta the brains, Yatori the brawn. The left hand and the right hand. Working in unison. The best indicator of their relationship, however, is how they sit with one another when alone. From their victory over the wolves to their nightly dinner talks, they sit back-to-back – because they have each other’s backs. If that doesn’t scream friendship, then nothing does. Yet there’s a twist. 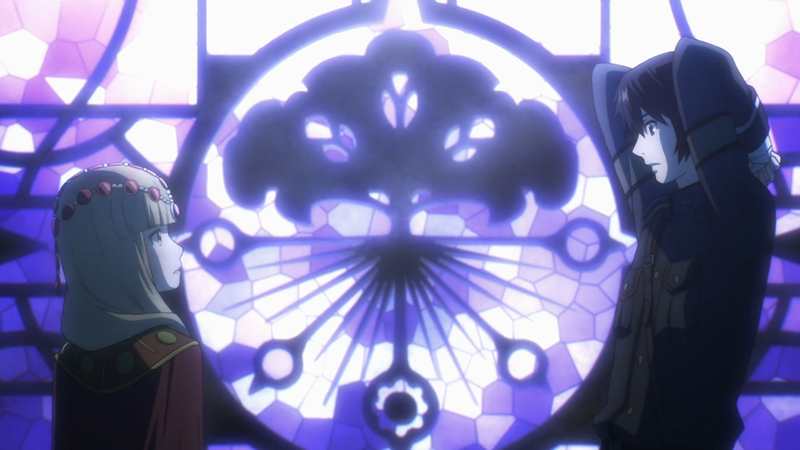 Throughout all of Alderamin, the show makes it evident how devout Yatori (and her family) is to the Empire. Willingness to cheat on the solider exams. Kneeling intently before Chamille. Reserving her family’s legendary sword style for her enemies. During their stalling of the Aldera army, Yatori and Ikta demonstrate their trust in one another again when they both commit the same act of saving the Sinack fighters. But, afterwards, when Suuya expresses her animosity about Ikta’s choice to forego his own men and questions Yatori about whether she always agrees with Ikta, Yatori responds in the negative. And Ikta understands. That is, she would choose to save the Empire over Ikta, killing him if need be. This quirk in their connection forms the basis for what will most likely be the biggest dramatic event in the series since it directly coincides with Chamille’s final orders before the season’s conclusion. Meaning, nothing actually came of it during the season. But their dynamic is no doubt a complex one, adding yet more intrigue to Ikta and the overall anime. Alderamin’s original soundtrack is surprisingly its best musical area. It reminds one of a fantasy RPG with woodwind tracks and an optimistic piano piece, giving the scenes the atmosphere they desire. The OST is sometimes whimsical, often filled with emotion, and always nice to hear. The ending track is not as strong, but, after a few listens, it starts to emerge in a favorable light. The soft lead in and the dancing piano throughout are easily the highlights, but the tonal selection – a semi-melancholic vibe – may not be the best fit for the show. Same goes for the fast-paced beat when considering the latter half of the season’s slower story. Nobuhiko Okamoto as Ikta comes out on top in terms of voice acting. His joking, serious style gives him many opportunities to act equal parts lazy man and commanding officer. Junji Majima as Matthew does well, too, with his ever-so-slight nerdy way of speaking. After these two, though, no other performances were notable. The opening track is arguably the weakest of all. If only because its more rock-and-roll, high-energy tone does not fit with the anime’s own. Plus, the distorted “whoa” and the ending, frantic guitar give the audience less happiness and more headaches. This anime is one of many where its first half is a lot more entertaining than its second half. Ikta was key to the entertainment. His wise cracking, his focus on logic, and his holier-than-thou attitude made him into a bit of a jerk, but it was still fun to see him outwit his opponents and generally remain unfazed by the situations he was thrust in. Also, his relationships with the others were fun, too. Yatori nonchalantly commenting about Ikta acting on his carnal desires. Chamille getting mad at him for wanting her lap to have “more meat.” Teasing Matthew (with Yatori’s help) for his self-applicable sayings. Haroma’s bewilderment at Ikta’s missing pinky. His envy towards Remeon’s naturally good looks. Even his small aside with Kanna, the girl who read Dr. Kahn’s book and started to question the world around her, was cute, too. Their dance in the town’s plaza put a smile on my face (only to have it replaced with a frown when she lost her life due to Ikta’s reasonable, tactical decision). And a shout-out goes to Yatori’s two major brawls. When she went ham against all the soldiers when protecting Chamille and when she dueled against Nana, it was pretty cool to watch. Especially the first one. Unfortunately, the second half wasn’t as interesting. Chamille left the group, Ikta cranked up the seriousness, and the war became the bigger focus rather than the characters. Not to say that there weren’t some fun moments, like Nana casually noting that it would have been fine for Ikta to sleep with her or Matthew’s masturbation conversation. But the action provided was not as intriguing. Same goes for Jean the villain. 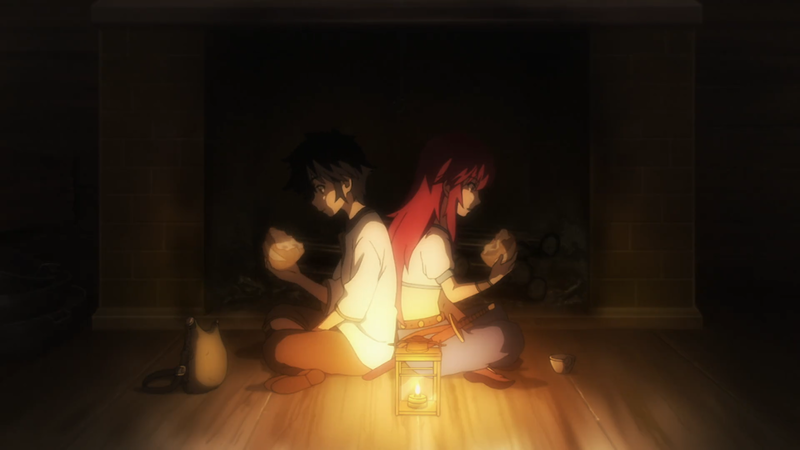 Nejimaki Seirei Senki: Tenkyou no Alderamin has moments of strength and weakness here and there, but it’s mostly a middle-of-the-road show. A story centered on cultural elements, a main lead who overshadows everybody else, and some pretty art, atmospheric music, and comedic happenings. An uneventful plane ride (and still no McDonald’s).